Clarksville, TN – The 2016-2017 academic year turned out to be a historic year for Austin Peay State University. 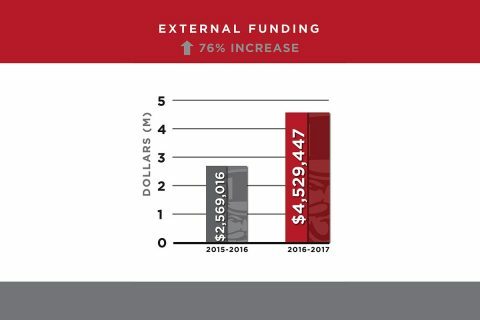 During that time period, APSU faculty and staff aggressively pursued outside funding to support research, student success initiatives and community outreach programs, resulting in a 76-percent increase in external grants over the previous year. That number marks the largest year-to-year increase in the University’s history. “Austin Peay’s faculty and staff, in their own unique areas of expertise, have earned the admiration of external agencies to support their endeavors, and they have brought the University to a new milestone of external funded support,” Dr. Chad Brooks, interim associate provost for research, said. The University received several high-profile grants during the last year. In the fall of 2016, The Clarksville/Fort Campbell Educational Opportunity Center, a free community service sponsored by APSU, received a $1.9 million U.S. Department of Education grant to continue helping adults enroll in college or other higher education programs. For the fifth year in a row, the Greater Nashville Affiliate of Susan G. Komen awarded a grant to the APSU School of Nursing, providing more than $200,000 in that time to fund breast health education and services to underserved populations in the community. Earlier this year, the Tennessee Higher Education Commission announced that Austin Peay will receive a $79,954 Veterans Reconnect grant to better serve veterans and service members working to earn post-secondary degrees.